Horse hoof, after technique of vinylite and corrosion, which allows for the visualization of the vascular architecture of the body. This specimen is on display at the University of São Paulo Museum of Veterinary Anatomy. English : Horse hoof, after technique of vinylite and corrosion, which allows for the visualization of the vascular architecture of the body. This specimen is on display at the University of São Paulo Museum of Veterinary Anatomy. English : Removing felled trees by the horses being carried out in Gwern Ddu woodland, Wales, which is a more environmentally friendly than use of tractors. English : Red fox (Vulpes vulpes) feeding on a sambar deer carcass recorded by a infrared digital camera. English : Aerial video of the place Yajima and Kyōjima on the island Sado, Niigata Prefecture, Japan, May 2017. Diesel locomotive ChME3-5947 in Vinnitsa railway station. This locomotive was manufactured in November, 1987. English : Diesel locomotive ChME3-5947 in Vinnitsa railway station. This locomotive was manufactured in November, 1987. English : Video of the various diesel passenger trains in Greece, May 2017. Main hall of Kiyomizu-dera, an independent Buddhist temple in eastern Kyoto. It is part of the Historic Monuments of Ancient Kyoto (Kyoto, Uji and Otsu Cities) UNESCO World Heritage site. English : Main hall of Kiyomizu-dera, an independent Buddhist temple in eastern Kyoto. It is part of the Historic Monuments of Ancient Kyoto (Kyoto, Uji and Otsu Cities) UNESCO World Heritage site. English : Video from fireworks in Yokohama port, Japan, August 2015. Papilio polytes, Common Mormon, is a common species of swallowtail butterfly widely distributed across Asia. Here the female is in the form stichius, mimicking unpalatable Pachliopta aristolochiae. English : Papilio polytes, Common Mormon, is a common species of swallowtail butterfly widely distributed across Asia. Here the female is in the form stichius, mimicking unpalatable Pachliopta aristolochiae. English : Moth Anthophila fabriciana on flower of tansy (Tanacetum vulgare) in a forest near Marburg, Hesse, Germany, 2011. Bottom view of an iwan in the Jameh Mosque of Isfahan, Isfahan, Iran. The mosque, an UNESCO World Heritage site, is one of the oldest still standing buildings in Iran and it has been continuously changing its architecture since it was erected in 771 until the 20th century. English : Bottom view of an iwan in the Jameh Mosque of Isfahan, Isfahan, Iran. The mosque, an UNESCO World Heritage site, is one of the oldest still standing buildings in Iran and it has been continuously changing its architecture since it was erected in 771 until the 20th century. English : Video of floodings caused by Hurricane Harvey in the city La Grange Texas from Austin Police Department helicopter, 28th August 2017. Male saffron finch (Sicalis flaveola) from the Pantanal in Brazil. The town of Saffron Walden got its name because the saffron crocus became an important crop in the 16th Century. English : Male saffron finch (Sicalis flaveola) from the Pantanal in Brazil. The town of Saffron Walden got its name because the saffron crocus became an important crop in the 16th Century. English : A Wedge-tailed grass finch (Emberizoides herbicola) singing at a nature reserve in Piraju in the state São Paulo, Brazil. English : A family of the wild boars (Sus scrofa) in Gevelsberg, Germany. A twin-engine civil helicopter Eurocopter EC135 in flight. English : A twin-engine civil helicopter Eurocopter EC135 in flight. English : Start and take-off of an Airbus Helicopters H135 (formerly Eurocopter EC135) air ambulance from a park in Germany, 2015. English : A short video from the Monster truck racing, September 2017. Swiss made needle files by Glardon/Vallorbe. Set consisting of 6 files, all 140 mm in length and Swiss cut 0. English : Swiss made needle files by Glardon/Vallorbe. Set consisting of 6 files, all 140 mm in length and Swiss cut 0. English : A short Dutch video from the year 1949 about the diamond exhibition in Amsterdam with demonstration of diamond grinding for production of jewellery. The Earth straddling the limb of the Moon, as seen from Lunar Reconnaissance Orbiter above Compton crater. The center of the Earth in this view is 4.04°N, 12.44°W, just off the coast of Liberia. The large tan area in the upper right is the Sahara desert, with Saudi Arabia just beyond. The Atlantic and Pacific coasts of South America are visible to the left. English : The Earth straddling the limb of the Moon, as seen from Lunar Reconnaissance Orbiter above Compton crater. The center of the Earth in this view is 4.04°N, 12.44°W, just off the coast of Liberia. The large tan area in the upper right is the Sahara desert, with Saudi Arabia just beyond. The Atlantic and Pacific coasts of South America are visible to the left. English : Video about Petrozavodsk and Petrozavodsk State University created by students of the University, Russia, 2017 (with English and Russian subtitles). Porsche 911 Carrera RSR, built in 1974, at the Oldtimer Grand Prix of the AvD 2011 at the Nürburgring, Germany, just before the Mercedes-Arena. English : Porsche 911 Carrera RSR, built in 1974, at the Oldtimer Grand Prix of the AvD 2011 at the Nürburgring, Germany, just before the Mercedes-Arena. English : The video from the 1963 Dutch Grand Prix in the Circuit Park Zandvoort on 23rd June 1963. Agriocnemis pieris, White Dartlet, belongs to Agriocnemis genus of small damselflies (commonly known as Wisps or Dartlets) in Coenagrionidae's subfamily Agriocnemidinae. English : Agriocnemis pieris, White Dartlet, belongs to Agriocnemis genus of small damselflies (commonly known as Wisps or Dartlets) in Coenagrionidae's subfamily Agriocnemidinae. English : The large red damselfly (Pyrrhosoma nymphula) in Burgwald near Marburg, Hesse, Germany, 2010. The Kinkaku-ji, or temple of the Golden Pavillion, an UNESCO World Heritage Site, in Kyoto, Japan, as seen during Koyo, the autumnal season of colorful leaves. English : The Kinkaku-ji, or temple of the Golden Pavillion, an UNESCO World Heritage Site, in Kyoto, Japan, as seen during Koyo, the autumnal season of colorful leaves. English : Aerial video of Fujitsuka-hama Beach, Shibata, Niigata Prefecture, Japan in summer 2016. Frontal view of the Central University Library of Bucharest and Carol I statue, Bucharest, Romania. The Central University Library was founded in 1895, 31 years after the foundation of the University of Bucharest, as the Carol I Library of the University Foundation. The building, designed by French architect Paul Gottereau, was completed in 1893 and opened on 14 March 1895. The volume collection has grown steadily from 3,400 volumes in 1899 to over 2 million in 1970. English : Frontal view of the Central University Library of Bucharest and Carol I statue, Bucharest, Romania. The Central University Library was founded in 1895, 31 years after the foundation of the University of Bucharest, as the Carol I Library of the University Foundation. The building, designed by French architect Paul Gottereau, was completed in 1893 and opened on 14 March 1895. The volume collection has grown steadily from 3,400 volumes in 1899 to over 2 million in 1970. English : Aerial video of the Danube river mouth into the Black sea (part of the Danube Delta) in Romania. English : Video from the North-East India - local peasants explain the traditional way of cultivating the land by repeated firing of forests in cca 10-years cycles. The Oceania-class cruise ship MS Marina docked in Sète, Hérault, France. English : The Oceania-class cruise ship MS Marina docked in Sète, Hérault, France. English : Timelapse video of the ship Seven Seas Voyager departure from the French port Lorient, Brittany, 2014. A view from the observation deck at the top station of the Duquesne Incline in Pittsburgh, Pennsylvania, USA. The Duquesne Incline is one of two surviving inclines in Pittsburgh, the other being the Monongahela Incline. 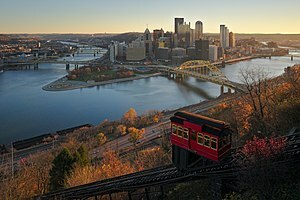 English : A view from the observation deck at the top station of the Duquesne Incline in Pittsburgh, Pennsylvania, USA. The Duquesne Incline is one of two surviving inclines in Pittsburgh, the other being the Monongahela Incline. English : Scenes from the old terminal building of Pittsburgh International Airport (formerly Greater Pittsburgh International Airport) from August 5th, 1988. Female Giant kingfisher (Megaceryle maxima) smashing a tilapia against a post to break its spine on Lake Naivasha, Kenya. To celebrate World Fisheries Day. English : Female Giant kingfisher (Megaceryle maxima) smashing a tilapia against a post to break its spine on Lake Naivasha, Kenya. To celebrate World Fisheries Day. English : Common kingfisher (Alcedo atthis) eating small fishes in England, May 2012. Inui-yagura Turret, guarding the outer moat of Osaka Castle and the skyline of Osaka Business Park, Osaka, Japan. English : Inui-yagura Turret, guarding the outer moat of Osaka Castle and the skyline of Osaka Business Park, Osaka, Japan. English : Altocumulus mackerel sky in Shinjuku Gyoen, Tokyo, Japan, with NTT Docomo Yoyogi Building clearly visible, November 2015. A high purity (99.999 %) rhenium single crystal made by the floating zone process, an ebeam remelted (99.995 %) rhenium bar and as well as a high purity (99.99 % = 4N) 1 cm3 rhenium cube for comparison. English : A high purity (99.999 %) rhenium single crystal made by the floating zone process, an ebeam remelted (99.995 %) rhenium bar and as well as a high purity (99.99 % = 4N) 1 cm3 rhenium cube for comparison. English : Video of the magnetic levitation and the contactless melting of piece of the metal, July 2010. English : Video of the red fox (Vulpes vulpes) catching a mouse near of the village Beluša, Slovakia, June 2014. An immature male bee hummingbird (Mellisuga helenae), the smallest bird in the world - it weighs only 1.6 grams. It is endemic to Cuba. Today is the first anniversary of the death of Fidel Castro, President of Cuba for over 31 years. English : An immature male bee hummingbird (Mellisuga helenae), the smallest bird in the world - it weighs only 1.6 grams. It is endemic to Cuba. Today is the first anniversary of the death of Fidel Castro, President of Cuba for over 31 years. English : Video from Festival of Lights, Berlin, Germany, 2017. The Berca Mud Volcanoes are a geological and botanical reservation located close to Berca in Buzău County, Romania. The phenomenon is caused due to gases that erupt from 3,000 metres (9,800 ft) deep towards the surface, through the underground layers of clay and water, they push up underground salty water and mud, so that they overflow through the mouths of the volcanoes, while the gas emerges as bubbles as you can see in the image. English : The Berca Mud Volcanoes are a geological and botanical reservation located close to Berca in Buzău County, Romania. The phenomenon is caused due to gases that erupt from 3,000 metres (9,800 ft) deep towards the surface, through the underground layers of clay and water, they push up underground salty water and mud, so that they overflow through the mouths of the volcanoes, while the gas emerges as bubbles as you can see in the image. English : Video from the Lassen Volcanic National Park in northeastern California, United States, 2002. A concept of NASA's Mars Science Laboratory Curiosity rover, a mobile robot for investigating Mars' past or present ability to sustain microbial life. In this picture, the rover examines a rock on Mars with a set of tools at the end of the rover's arm. English : A concept of NASA's Mars Science Laboratory Curiosity rover, a mobile robot for investigating Mars' past or present ability to sustain microbial life. In this picture, the rover examines a rock on Mars with a set of tools at the end of the rover's arm. English : Footage from John B. Watson's 1920 Little Albert experiment on classical conditioning. Kiyomizu-dera in Kyoto, Japan, an UNESCO World Heritage Site, is an independent Buddhist temple. English : Kiyomizu-dera in Kyoto, Japan, an UNESCO World Heritage Site, is an independent Buddhist temple. English : J-class yachts race for the World Championship NYYC & Newport Shipyard @ Newport RI. A Sukhoi Superjet 100 (RA-97004) of Alenia Aermacchi flying off the coast of Italy near Turin. English : A Sukhoi Superjet 100 (RA-97004) of Alenia Aermacchi flying off the coast of Italy near Turin. English : Short video from first (maiden) flight of the new Russian airliner Irkut MS-21, May 2017. Vanessa indica, Indian Red Admiral, is a butterfly found in the higher altitude regions of India. Males commonly imbibe mineralised moisture from damp ground, and also visit dung or decomposing fallen fruit. English : Vanessa indica, Indian Red Admiral, is a butterfly found in the higher altitude regions of India. Males commonly imbibe mineralised moisture from damp ground, and also visit dung or decomposing fallen fruit. English : Neighbors is a 1920 American silent short comedy film co-written, co-directed by, and starring Buster Keaton.